Library image #1899: Canoers on the Allegheny River, enjoy the trip downstream from Baker Island. The United States Congress designated the Allegheny Islands Wilderness (map) in 1984 and it now has a total of 372 acres. All of this wilderness is located in Pennsylvania and is managed by the Forest Service. Northwestern Pennsylvania’s Allegheny Islands Wilderness is, at just 372 acres, one of the country’s smallest wilderness areas. It’s nevertheless a fascinating and ecologically precious one. The wilderness, established in 1984 and managed by the U.S. Service, is located on seven islands scattered along a 56-mile stretch of the Allegheny River, between the Buckaloons Recreation Area and the town of Tionesta. Terrain The islands of the Wilderness—Crull’s, Thompson’s, Baker, Courson, King, R. Thompson’s, and No-Name—were formed by the alluvial action of the Allegheny. Built of sand, mud, and clay originating in the Allegheny Mountains, they owe their size, shape, and changeable character to the river’s restless patterns of deposition and erosion. At 96 acres, Crull’s Island is the largest in the Allegheny Islands Wilderness; No-Name, by contrast, is just 10 acres in size. Major tributaries along this length of the Allegheny include Anders Run, Clark Run, Thompson Run, Tidioute Creek, East Hickory Creek, and Little Hickory Run. Ecology The Allegheny Islands Wilderness preserves outstanding groves of old-growth bottomland forest, although ecosystems here are in multiple successional states due to the regular influence of flooding, storms, and other disturbance agents. Typical hardwoods include American sycamore, silver maple, green ash, slippery elm, shagbark hickory, butternut, hawthorn, and willows. Some of the trees are impressively large: Within the Wilderness is Pennsylvania’s (current) champion sycamore, a 148-foot-tall specimen. Birdlife is prolific and varied within the Wilderness and adjoining portions of the river. Keep an eye peeled for great blue and green herons, kingfishers, turkey vultures, ospreys, bald eagles, and numerous varieties of waterfowl. The waters are important habitat for the Allegheny’s globally significant population of freshwater mussels. Notes This area was historically frequented by a number of American Indian cultures, particularly the Iroquoian Seneca. During the Revolutionary War, Thompson Island was the site of a fight between allied British/Iroquois forces and American soldiers under the command of Col. Daniel Brodhead. No designated trails exist in the Wilderness, but the river-bottom woods are fairly easy to explore cross-country during early spring, before understory vegetation thickens. Canoeists and kayakers have much to explore: The portion of the Allegheny in the Wilderness belongs to an 87-mile “Recreational” stretch classified in the National Wild & Scenic Rivers System. 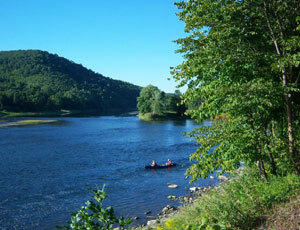 Planning to Visit the Allegheny Islands Wilderness? How to follow the seven standard Leave No Trace principles differs in different parts of the country (desert vs. Rocky Mountains). Click on any of the principles listed below to learn more about how they apply in the Allegheny Islands Wilderness.